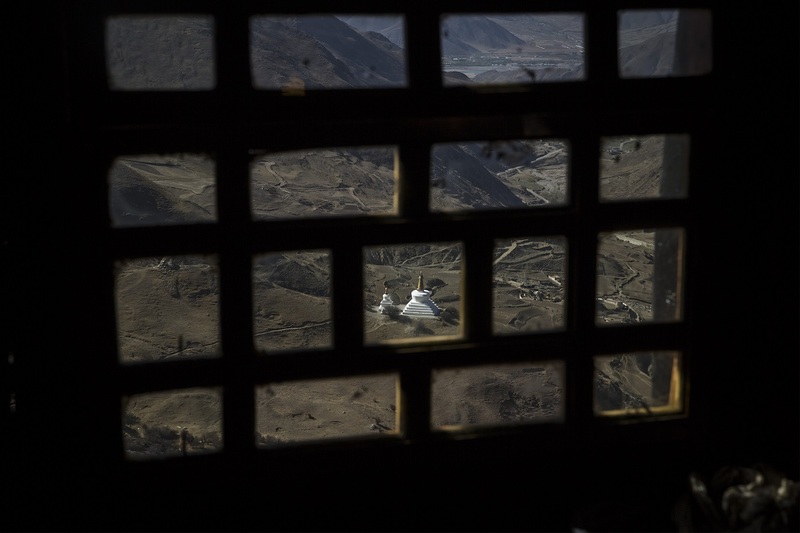 A pagoda is seen through a window in Drak Yerpa, Lhasa, Tibet Autonomous Region, April 27, 2017. It takes a lot to get our attention. The current visibility of the situation in Xinjiang has taken a mammoth effort of dedicated scholars, journalists, and activists to not only gather information about the concentration camps, but to tell and retell the story to catch and hold our attention. Statistics have played an important role—how many camps? Detainees? Square meters of ground? Visuals have been important too—particularly the satellite images of concentration camps springing up and spreading out in the desert. These have created an optics of urgency, a striking spectacle of the scale and speed of oppression. But how do we draw attention to violence and oppression when they are invisible, unspectacular, numerically small, or slow? The tragedy of contemporary Tibet is mostly characterized by slow violence—by structures of oppression, more than events. We see this, for example, in the politics of language. Although occasional protests render some Tibetan grievances visible, linguistic oppression itself takes place as an invisible eugenic grind across generations. The national language, Putonghua (standard Mandarin Chinese), is aggressively promoted. Learning and using it are compulsory; Tibetan is optional. This imbalance between the obligatory and the voluntary, over time, leads to a slow tip away from Tibetan and towards Putonghua, in institutions, communities, and families, and in individuals’ daily lives. This imbalance penetrates language. While the full weight of the Party-state is applied to policing the borders of Putonghua against foreign terms, minority languages struggle against an influx of Putonghua. Not only Tibetans, but also Uighurs, Yi, and Mongolians, have responded with campaigns to reject Putonghua terms, fearing a sort of death by lexical replacement. This struggle plays out in daily life, in the myriad word choices that constitute the micro-politics of language. But linguistic oppression takes far more pernicious forms than an imbalance between a dominant national language and subordinated minority languages. The hidden tragedy of China’s language politics is the way in which the state does not even acknowledge the existence of most of the country’s languages. In the Tibetan case, this means completely ignoring the existence of almost 30 distinct languages spoken by Tibetans in China (in addition to “Tibetan”). These languages are excluded from schooling, media, and all public space. Tibetans who speak these languages are faced with a grim choice between the dominant language of the state or the minoritized language of their “nationality.” Unsurprisingly, all these languages are on the wane, their speakers shifting either to Tibetan or Chinese. Dominance and erasure are the stable, invisible structures of Tibetan language politics. Erasure, in particular, is difficult to render visible. What optics of urgency will render visible the silenced tongues of Tibet? The issue, then, is not that attention to Xinjiang has drawn attention from Tibet, but that the visible has drawn attention from the invisible. The horrific situation in East Turkestan is paradoxically helping Tibetans and others under Beijing’s repressive rule by awakening the international community to the true hardline nature of Xi Jinping and the Chinese Communist Party. This is creating more political will in foreign capitals to hold Chinese leaders accountable for their human rights transgressions. For over two decades, many argued the opening of China’s markets would liberalize China’s political system and bring greater freedom, including to Tibetans and Uighurs. Discussions of China’s rights violations were all but suppressed to allow Chinese leaders to save face and to make them more open to substantive reforms. This approach has been a spectacular failure. Having paid no price for their rights abuses, Chinese leaders have been emboldened to escalate their repression, not just in Tibet, East Turkestan, and China proper, but even in Hong Kong. The breathtaking scale of the repression in East Turkestan will hopefully lead to more clear-eyed policies from world governments when dealing with China. We are seeing moves toward concrete political action in the U.S. that seek to hold Chinese leaders accountable for the internment camps. The unanimous passage of the Reciprocal Access to Tibet Act in the United States House of Representatives in September, after years of failed attempts, is another sign political leaders recognize the need to change the approach to China’s abysmal human rights record. It remains to be seen if the Senate will pass this legislation in time for it to be signed into law before the end of the year, but, overall, this new willingness to make Beijing pay for its actions in Tibet and East Turkestan is movement in the right direction. Before he was transferred as Party chief to Xinjiang in 2016, soldier-turned-politician Chen Quanguo developed one of the world’s most dystopian police states in Tibet. Surveillance technology by one of the world’s biggest CCTV companies, Hikvision (which provided a system for the railway to Lhasa prior to its use in prison camps in Xinjiang), was combined with the deployment of tens of thousands of Party cadres in monasteries, schools, and homes, with the aim of rewiring Tibetan thoughts and beliefs, giving rise to fears of nothing less than obliteration of cultural and religious identity. Chen’s “war against secessionist sabotage” followed a wave of overwhelmingly peaceful protests across Tibet in March 2008. Risking their lives to assert that the Dalai Lama represents their interests and not the Communist Party’s, Tibetans propelled the issue of China’s policies on the plateau to the top of the international news agenda. Governments began to take Tibet more seriously—an approach that was compounded by the wave of self-immolations that began in 2009. Policies in Xinjiang can be understood best in parallel to those in Tibet. In both areas, profiling certain groups, such as Tibetans who travel to Dalai Lama teachings in India, has expanded to encompass an entire “ethnic nationality,” assisted by facial recognition technology that purports to distinguish them from Han Chinese. In Tibetan border areas, troops from Xinjiang train with their Tibetan counterparts in gyms equipped with high-tech sensory equipment at altitude in order to ensure peak performance in enforcing securitization in both areas. Importantly, the current global focus sheds light on a harsher new policy direction regarding non-Han minorities that has never been publicly announced. The obsessive mantra of ensuring “stability” has come to mean not only total compliance to Party diktats and the crushing of all dissent, but the creation of a society in which dissent is not even thought about, as ideas that differ from those of the Party state are seen as the root causes of instability. Thanks to painstaking research and the courage of those who have borne witness, the crisis in Xinjiang has brought human rights in China back to the forefront of the international agenda. Moves to challenge China on the global stage over Xinjiang are vital. Far from detracting from the significance of what is happening in Tibet, it casts in sharp relief the oppressive measures trialed first in Tibet and the threat that China’s networked authoritarianism presents beyond its borders.